If you ask pro drivers whether racing simulators have brought benefits to modern motorsports, most would answer yes without hesitation. For teen drivers, it’s widely recognized that driving simulators can help teach basic skills. But what about the middle ground? Can sims help HPDE students -- especially novices? And how can HPDE instructors leverage the sim experience that their students might bring to the table? When it comes to sims, I’m a big fan. I’d call myself a borderline junkie, having racked up some 1,500 hours of seat time over the past few years. Sims have made me a better driver and a better instructor, but I’ve also seen the soft white underbelly. Sims can actually reinforce a driver’s inherent weaknesses, and they can fail to develop some necessary strengths. So let's examine sims from the perspective of coaching a novice HPDE student who has sim experience. As the Tonight Show's Jimmy Fallon might say, "It’s time to weigh the good with the bad." Fact: for a student with zero track experience, sims can effectively teach basic concepts such as braking, apexing and accelerating. They can introduce the ideas of learning a track and practicing to go faster. Students who have seen these concepts in virtual reality will be less overwhelmed on Day 1 of their first HPDE. They will be more able to absorb instruction, and more likely to have fun. Score one for sims! Other benefits? Sims can provide a safe off-track venue to learn new pedal skills such as heel-toe or left-foot braking. They can make it easy to experiment with changing tire compounds, suspension settings and aerodynamics. They can let drivers compare different types of cars such as front engine vs. rear, or rear drive vs. all-wheel drive. They can give students time to practice smooth inputs to the pedals and wheel. All of these features can benefit HPDE students safely and at low cost. What’s not to like? Actually, drivers can only reap the full rewards of sims if they know to look out for the “offsetting penalties" inherent to simulators. Some involve skills related to situational awareness. Some have simple workarounds, and some do not. One drawback is that sims can teach tunnel vision. For most sim users, the field of view is small because the screen is only 15-30 inches wide. These drivers tend not to develop the skill of rotating the neck to look around a corner. Why should they? The sim places all the action directly in front of them. Luckily, there is a workaround: multiple screens. Granted, it requires a bigger commitment in terms of both floor space and budget. For example, a three-screen Gran Turismo rig requires three PlayStation consoles and three copies of Gran Turismo, plus network components and supports for the three screens. But it does provide a more realistic experience that reduces the tunnel-vision effect. Another drawback: although sims include changes in track elevation, seeing them on a two-dimensional screen is difficult at best. As a result, sims can unintentionally teach drivers to ignore dips and humps in the track, and their important effects on grip. Sim drivers who use only a game controller are missing out on a big part of the action. A student twiddling his or her thumbs on a PlayStation controller will not learn much about pedal technique. 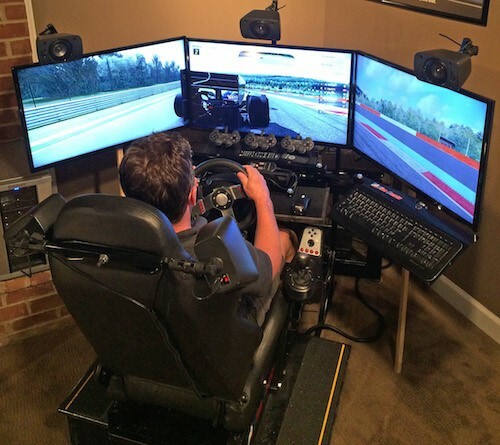 The workaround, of course, is to incorporate a steering wheel and pedals into the sim rig. A three-pedal setup with a six-speed shifter is a worthy investment, especially when combined with a racing seat. Typical sims do not recreate the acceleration forces that constantly try to throw the driver around in the seat, so they fail to prepare the first-time HPDE driver for this aspect of the experience. Here, the only workaround is a full-motion sim rig – and drivers who can afford that extravagance are probably hiring private coaches rather than attending HPDEs. Other HPDE features are notably absent from sims: warm-up laps; passing signals; in-car coaching; and operational flag stations. That last one has always bugged me. Sims do absolutely nothing to develop flag awareness. A successful sim driver might not even know any flags beyond the “you win” flag. A more serious failing is that sims can train drivers to ignore non-visual inputs. Sim drivers raised on video games tend to drive with high-volume background music that prevents them from hearing the engine, tires and nearby cars. Many rigs lack vibration feedback that provide important clues about the track and the car. Workarounds include: (1) turning off the music; (2) incorporating a good surround-sound system; (3) using a force-feedback steering wheel; and (4) installing a seat-mounted shaker. And the biggest drawback of racing simulators? Chronic use can inspire massive over-confidence, which can be dangerous on a race track. Sims are designed to produce adrenaline-pumping, full-throttle action. They usually require drivers to run at ten-tenths, which is okay, because mistakes lack real consequences. That combination leads drivers to adopt risk strategies that are not appropriate for HPDEs. By the time I started driving sims, I already had ten years of HPDE experience. I had a pretty good calibration of my track skills. As I tore around Gran Turismo's Nürburgring flat-out in my race-prepped supercar, I intuitively knew that I wasn't ready to go that fast on a real track. A novice HPDE student moving from sims to real tarmac might lack that perspective, and could end up driving well beyond ten-tenths. Imagine the very first time a veteran sim jockey drives out onto a real track. Instinct will say to hammer the throttle, even though the driver is wildly unprepared. And, as Tom Roberts recently pointed out in his excellent article [SSW #113, Driving The Nürburgring, June 30, 2015], even experienced drivers can fall prey to the overconfidence trap. Fine, so sims have some flaws. What's the most important workaround of all? Good coaching! Instructors, especially in green and yellow groups, would do well to ask whether their students have sim experience. Students who do should be told: you might not be as good as you think! Being aware of overconfidence -- crawl, then walk, then run! With a little attention to details like these, HPDE instructors can help students get the most out of their seat time – both virtual and real. And when those students are enjoying their virtual pastime between events or over the long winter, they will have the perspective to keep their development on the right track.